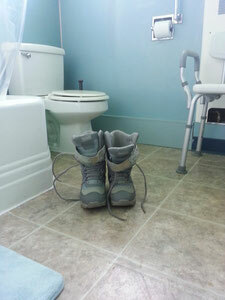 ".......I walked by the bathroom and was surprised to see her boots in the middle of the floor. I recalled seeing them hidden under her pillow at the homeless shelter. It must feel safe here....."
Sally came to Amahoro House for medical respite in February. The community emergency room had treated her for bronchitis and a near catastrophic thyroid level, and discharged her to the street. She was not resting at the shelter and thus unable to meet with housing advocate volunteers, and maintain discharge medication plan. The morning the Amahoro House volunteer encountered her boots in the bathroom marked day three of her medical respite stay. On this morning she was sleeping in one of two designated respite beds, and would later meet with her housing advocate volunteer. During her short stay at Amahoro House Sally would recover from her illness and make progress towards housing, open a bank account, and begin the long process of moving her medical home to a local provider in Olympia, Washington. With access to food, rest, and structured day she would complete her antibiotics and steroid to assist her recovery. Amahoro House is one of only a handful of medical respite efforts in Washington state, and the only effort in the South Puget Sound. Medical respite is defined by the National Health Care for the Homeless Council as " short term residential care that allows homeless individuals the opportunity to rest in a safe environment while accessing medical support and other supportive services." The team at Amahoro House creates an intentional nurturing and safe environment to aid in guests recovery. For Sally this meant plenty of mint ice cream, long naps and an afternoon spent with volunteer Pam online looking for her father whom she hadn't seen in over 50 years. I will send more information about myself. Regardless of how frequently I read it, it never gets old. You certainly hit the nail on the head on this one. This is something individuals need to think about. Your blog is really mind blowing and the design is really first class.